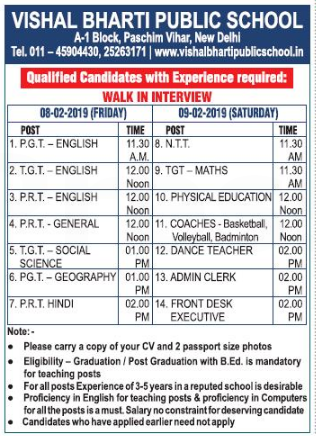 Vishal Bharti Public School, New Delhi has advertised in THE HINDUSTAN TIMES newspaper for recruitment of Teachers PGT / TGT / PRT / NTT jobs vacancies. 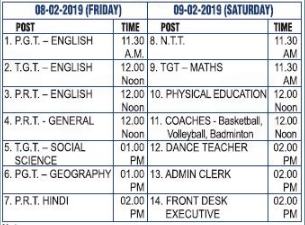 Interested and eligible job aspirants are requested to walk-in on 08th and 09th February 2019. Check out further more details below. About School: VBPS is a school where students from diverse backgrounds grow, get involved in various activities and form a strong community. The school has proved its excellence academically, in creative & performing arts as well as in sports, throughout its establishment of more than 27 years. Our excellent and experienced staff members strive to give every student the attention necessary to achieve his/her individual success. UG / PG with B.Ed. How to Apply: Interested candidates are requested to attend the Walk-in interview by bringing their CV and 2 passport size photos to the address mentioned below.